Year 2018 in the LVM Nature Park in Tērvete has been very active – infrastructure maintenance and improvement works have been done, dwarf town's construction has continued, more than 30 events have taken place, the 60th anniversary of the park has been celebrated. On this big anniversary year we have received a pleasant appreciation from tourists – one of the most popular tourist attraction places of Latvia has been visited by the largest number of travellers in the history of the park – 156 thousands. In comparison to the year 2017, the number of visitors has grown by 7%. Even though Tērvete is located in the plain of Zemgale, it has a relief that is not characteristic to a plain. In year 2018, Tērvete was discovered by active trail runners as a place to express themselves – getting to know and enjoy the valley and the steep shores of Tērvete river, the magic of Tērvete mound and the vastness of ravines, and of course, the stair sections and hillocks characteristic to Nature Park in Tērvete. For the first time the popular, challenging and most importantly cheerful trail run “Stirnu buks” took place in the LVM Nature Park in Tērvete! Looking into the new year 2019 – second competition of the new season of trail run STIRNU BUKS will take place in Tērvete. Time to start preparing – on April 27 run in the forest! More information – stirnubuks.lv! Year 2018 in LVM Nature Park in Tērvete brought several records... for the twentieth time Nature Park held the magical and most surprising event of the year – “Mysteries of Walpurgis Night”, which every year in the Fairytale Forest gathers bigger and bigger crowd of visitors. Last year sensation seekers have been particularly active and have broken the previous records – event was visited by more than 9 thousand enthusiasts of night events! For the first time in Latvia, and where else than not in Tērvete, the “Forest Days of Latvia” took place and gathered around 100 different organisations connected with forestry, woodworking and environment. Visitors had a chance to participate in more than 80 educational forest workshops, take part in different types of educational activities together with dwarfs, Pig Man and real forest men. In the two days, the event was visited by more than 12 000 children, youth and adults from all over Latvia. At the end of year 2018 we are announcing second “Forest Days of Latvia” event! 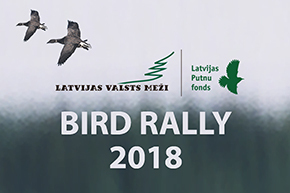 In year 2019 the largest forest informative event in the Baltic, the “Forest Days of Latvia” will take place on the 24 and 25 May at the LVM Nature Park in Tērvete. See you in forest! Year 2018 brought a lot of warm and sunny days. The autumnal golden leaves’ madness in nature summoned an impressive number of visitors, even though traditionally Sigulda has been a place to enjoy the colour games of nature. However, on the 13 and 14 October it seemed that citizens of Latvia have chosen an autumnal walk in Tērvete instead. On these days Nature Park was filled with impressive number of visitors once again – for the fourth time Tērvete was visited by more than 10 thousand guests in one year. A special novice and joy of the last year – a collaboration with domestic producers and craftsmen of Tērvete has begun, all through the summer in the dwarf town Čiekure they offered their tasty and healthy goodies for all tastes. Guests of dwarf town Čiekure were able to evaluate not only what is growing in the town, but also taste snacks that have been made in Tērvete. Each year Čiekure is extending with some new, surprising district – all together dwarfs have planned more than sixty different buildings and objects. Nature Park in Tērvete for couple of years is offering various educational classes, hikes and creative workshops for pre-school and school groups, that all in the framework if environmental education programme “Learning about Forest”. In 2018, 5.9 thousand children and youth have used the opportunity to combine active recreation, practical lessons and environmental education in forest. Almost half of Nature Park's visitors have spoken in a foreign language – last year number of foreign tourists has made 40% from the total number of guests. The fairytale land of writer Anna Brigadere has been visited by nature friends and active recreation seekers from all over the world. Our closest neighbours remain in the lead – Lithuania and Estonia. It must be mentioned that in summer months, during vacation time, Nature Park has been visited by an impressive number of tourists from Israel, Germany, Canada, Russia, USA and Italy. Here, at the LVM Nature Park in Tērvete, hearts are opening to a miracle, the magical air of pine forest is breathed in and eyes start to sparkle with mischievous, childish joy! The new year 2019 also is promising to be interesting and rich with news. See you soon!